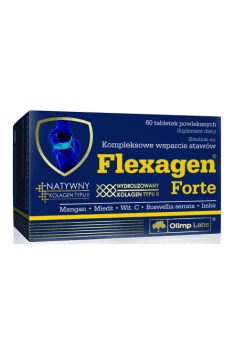 Olimp Flexagen Forte is a top-quality dietary supplement that supports the skeletal system in a complex and efficient way. The product stands out thanks to the use of the most effective substances necessary to maintain the right condition of bones, tendons and ligaments. Type II collagen (hydrolysate and the native, undenatured form) – type II collagen facilitates the differentiation of osteoblasts (the basic bone-forming structures), reduces joint pain (especially during workout), and exhibits the ability to improve many parameters connected with pain caused by joint degeneration (indexes WOMAC, Vas, and Lequesne) when supplemented regularly. Collagen also exhibits efficacy in reducing the intensity of rheumatic pains (according to research, it stems from its ability to reduce splenocyte immunoreactivity and to increase the production of interleukin 10, which eliminates the activity of pro-inflammatory interleukins 17). Additionally, it is worth mentioning that collagen improves the condition of the skin when used regularly. Chondroitin sulphate – an important element of cartilage tissue, responsible for the compressive strength of cartilages. It has anti-inflammatory properties, stimulates the synthesis of proteoglycans (collagen components) and hyaluronic acid (which reduces inflammation), and reduces the level of the degradation of chondrocytes (cartilage tissue cells). It has also been demonstrated that chondroitin has a positive effect on reducing the influence of degenerative ailments of joint structure. Glucosamine sulphate – glucosamine is an amine glucose derivative found in many cells of the body; however, its greatest amounts are found in joints and cartilage tissue. It is a component of keratan sulphate (which works as cushioning for joints), and hyaluronic acid. It helps to eliminate negative degenerative lesions that affect excessive collagen degradation. A positive effect of the substance has also been demonstrated regarding the reduction of joint pain. Boswellia serrata extract – exhibits great anti-inflammatory potential and is particularly recommended in the case of joint inflammation induced by degeneration. It reduces the level of osteoclasts (cells responsible for breaking down bone tissue). Research shows that Boswellia improves many markers connected with joint degeneration (indexes WOMAC, Lequesne, and VAS), and the percentages of the sensation of pain (the reported pain reduction was 70-80 percentage points!). Another effect observed was an increase in joint mobility and a reduction of their swelling. It is worth mentioning that the anti-inflammatory effect does not only apply to the skeletal system, but to the entire organism. Vitamin C – actively participates in normal collagen synthesis, so its proper levels are essential for maintaining the right condition of joints. Additionally, it has been observed that vitamin C deficiency can lead to bone tissue loss. Ginger – substances contained in ginger (gingerols) exhibit systemic anti-inflammatory activity (research has demonstrated a reduction of pain connected with joint inflammation). Hyaluronic acid – an important component of cartilage tissue. It is responsible for the compressive strength of the tissue. It also determines normal joint mobility. It regulates the organism’s inflammatory responses as well, which are necessary for proper connective tissue regeneration. Manganese and copper – minerals that help to reduce bone tissue loss, especially during menopause. The deficiencies of those substances can be one of the reasons of bone tissue dysfunctions, as they are cofactors of many enzymes connected with bone metabolism. To sum up, Olimp Flexagen Forte is a fantastic product for people who struggle with joint problems, both temporal, connected with intensive workout at the gym, and those caused by chronic diseases. The good reputation of the manufacturer is an additional advantage and guarantees the use of only top-quality components. Take 2 tablets daily, with plenty of water. In order to complement the improvement of the condition of the skeletal system, it is recommended to increase the consumption of protein, which is a structural element in the organism. In the case of acute joint pain, for example connected with intensive training, you can double the dosage of the product. Bulking agent - microcrystalline cellulose; glazing ingredients - hydroxypropylmethylcellulose, polyethylene glycol; anti-caking agents - magnesium stearate, silicon dioxide; Sodium hyaluronate. Product enables better use of oxygen and increases energy capacity of the organism during physical effort. Extreme pre-workout dietary supplement that adds energy and improves motivation and endurance. One of the strongest cutting-edge pre-workout supplements. Dietary supplement containing caffeine. Stimulates the central nervous system, and adds energy and supports metabolism. Advanced pre-workout blend. It increases effort abilities, stimulates and increases energy level. Collagen is a major component that builds connective tissue (tendons, ligaments cartilage, bone, and blood vessels) from the group of fibrous proteins (i.e. scleroprotein), representing a quarter of the content of protein in the body. It is composed of amino acids (glycine, hydroxylysine, hydroxyproline and proline). Distinguished are eight types of collagen located in different parts of the human body. The source of the acquisition is gelatin (a component of the connective tissue of animal origin). It occurs most frequently in the form of processed collagen hydrolyzate characterized by a high and a good absorbency of amino acids. Recommended in sports supplementation and physically active people, as well as during convalescence after injuries and certain diseases. Available as mono-preparation supplement or of multi-compound supplement (usually also containing chondroitin, hyaluronic acid, and ascorbic acid). Dosage: 10-20 g per day. Chondroitin sulfate has chondroitin in its composition, belonging to the glycosaminoglycans, affecting the maintenance of joint stability and strength (building component of cartilage). Chondroitin sulfate proteins involved with the synthesis of proteoglycans. It is synthesized in the body or delivered in the foods of animal origin (e.g. containing tissue). It is used by athletes in the disciplines greatly aggravating the locomotor system with exercises, as well as in the treatment of sports injuries and joint recovery and rehabilitation after injuries, increased demand also occurs in people of advanced age. In the sports supplementation is a component of multi-component combined supplements, often containing hyaluronic acid, glucosamine and hydrolysed collagen, supporting the functioning of the locomotor system. Dosage: 500-1500 mg per day. Glucosamine sulphate (glucosamine) is an amino sugar present in cartilage matrix; compound needed for the glycosaminoglycans and proteoglycans, affecting its structure and flexibility, increasing immunity to overloads. Glucosamine is synthesized in the human body, it can be supplied from the outside (a component of shells of marine crustaceans, and in coatings for fungi) as supplements. Increased demand for glucosamine occurs in sports training (athletes exposed to overload the musculoskeletal system), during convalescence after injuries and contusions, moreover, in the case of older people in prevention and therapeutic of degenerative changes of the locomotor system. Glucosamine occurs as mono-preparation or multiple preparations (including, among others, hyaluronic acid and chondroitin, collagen hydrolyzate and ascorbic acid) in supplementation in supporting the functioning of the musculoskeletal system, such as d-glucosamine sulphate 2KCl; HCL Poly NAG. Boswellia serrata extract, shows efficacy in the treatment of degenerative arthritis (particularly the knee), rheumatoid arthritis, colitis and Crohn's disease. There are ongoing attempts to use boswellic acid for the treatment of cancer. The sports supplementation uses it in the prophylaxis and the treatment of injury and inflammation occurring in the overloads of joints and during rehabilitation. Mainly used together with agents intended to assist the functioning of the organs of motion (e.g. Glucosamine, ascorbic acid, collagen, etc.). Dosage: after consulting medical 50-200 mg per day (the amount depends on the standardized extract). Hyaluronic acid (sodium hyaluronate) is a glycosaminoglycan, which do not form covalent bonds with proteins and does not contain sulfate groups. Creates so called proteoglycans aggregates absorbing water and which are responsible for the resistance of cartilage. It is one of the components responsible for the intra-articular fluid viscosity. It takes part in the regeneration of skin tissue. It is synthesized in the body providing a full daily demand. Supplementation applies to athletes exposed to overload of the locomotor system. It is a component of preparations supporting the regeneration of joints and tendons and cosmetics supporting the condition of hair, skin and nails.